Sadly, bullying is increasingly becoming a bigger problem in schools, on the Internet, on sports teams and even in homes. Communities on Vancouver Island have experienced bullying first-hand, but the message of Pink Shirt Day is that bullying is not acceptable. Students in Nova Scotia were first inspired to create Pink Day five years ago. The students were protesting against the bullying of ninth grade classmate and instead started a nationwide movement. 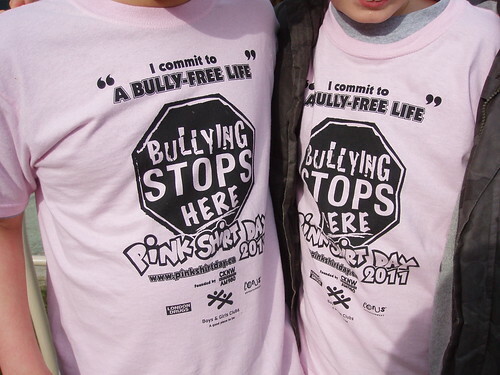 A number of schools across Vancouver Island have pledged to support Pink Shirt Day 2012, including Brooklyn Elementary in Comox, Queen Margaret’s School in Duncan, Gwa-sala-‘Nakwaxda’xw School in Port Hardy and Qualicum Beach Middle School. On February 29th, join the tens of thousands of Canadians that are saying “no” to bullying by wearing pink or by purchasing a Pink Day t-shirt at all Vancouver Island London Drugs locations. For more information on Pink Day, visit the website or stay in the loop with Facebook and Twitter. Have you heard of Kindness Rocks and the World Kindness Concert? These are organized and put on by motivational speaker Brock Tully. If you google his name you will be directed to his website. Kindness Rocks is concerts that are put on it schools around the lower mainland to educate and help put an end to teenage bullying. They have been really well received by the high schools as Brock recruits some great musicians to help deliver the message to the teenagers. What a great initiative! Thanks for sharing! !